One thing separates La Condesa (“the countess,” referring to a colonial-era landowner and figure of Spanish royalty) from some of the other neighborhoods that I mentioned in my opening paragraph. Condesa streets twist and turn, making for a surprise departure from the grid-like pattern of El Centro and other neighborhoods of interest to visitors to Mexico City. Insurgentes, the busy thoroughfare that more-or-less marks the eastern edge of Condesa, is said to be one of the longest straight streets in the world. West of here, Nuevo León is lined with bars and restaurants but runs north-south in a similar fashion. Between and around these two streets, however, the maze of residential calles and avenidas contain a veritable potpourri of neighborhood delights. One such street, Avenida Amsterdam, is a sort of ring road that, while only one lane wide in each direction, makes an outer circle through much of Condesa. A jogging path, complete with street lights and park benches, acts as a median. Amsterdam passes close to one of my favorite Mexico City parks, the aptly-named Parque México. This large park has been undergoing something of a spruce up – particularly around the concrete, open-air Lindbergh Theater, but I always found Parque México to be a great place for people watching. Dog watching, too; dog walkers often wait out the heat of midday under one of the park’s many banyan trees. The walkers text their girlfriends while the dogs nap in the shade. Meanwhile, hipster trainees proudly mug in front of their political graffiti, tagged by the park’s main entrance for the biggest possible audience. Further north, east-west Avenida Álvaro Obregón is one of the neighborhood’s most important streets, and was a regular breakfast haunt for yours truly. 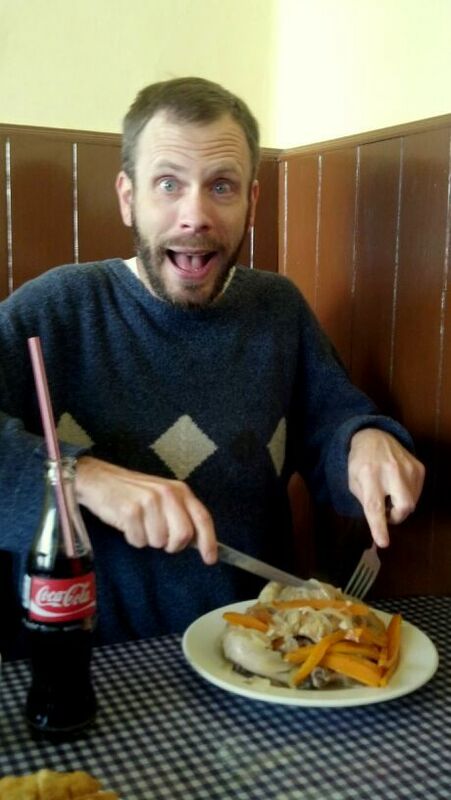 A regular ritual for me was to teach a Saturday morning class in all-work-and-no-play Santa Fe, then hop off the return bus in Condesa and grab a late breakfast at one of the sidewalk cafes along Álvaro Obregón. Like Amsterdam, A.O. 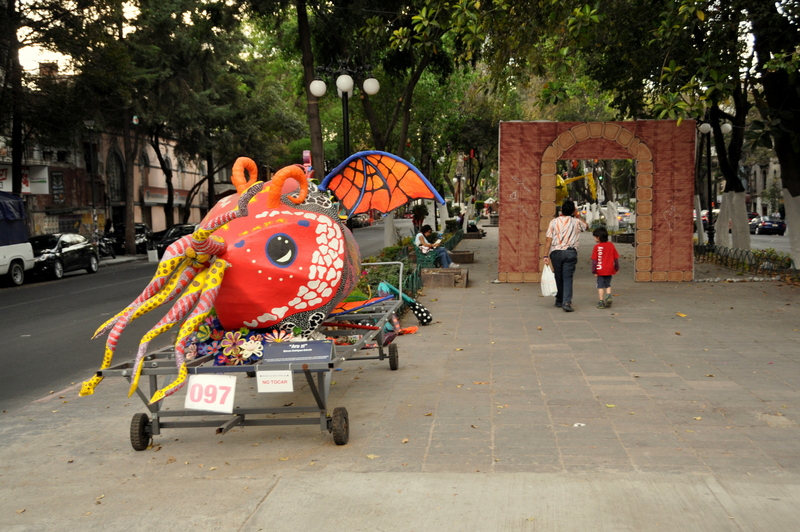 features a pedestrian median; this one has rotating sculpture art on display, and EcoBici kiosks where you can rent bikes by the day or hour. 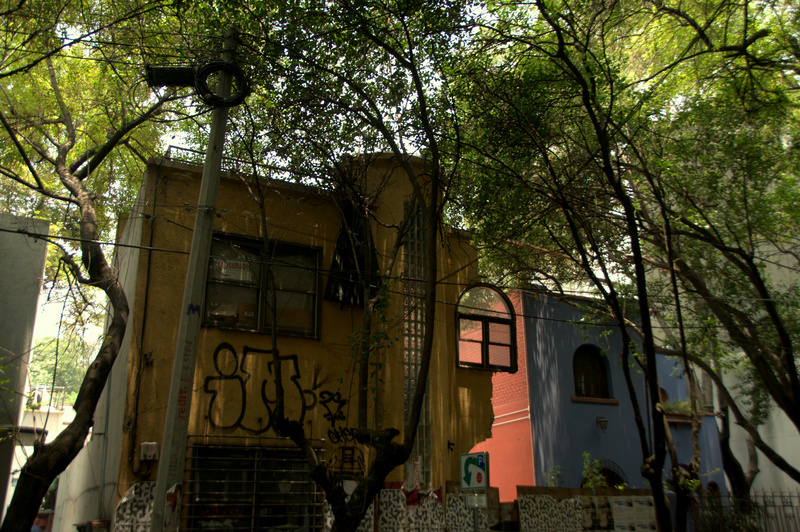 Galería Casa Lamm, at Álvaro Obregón #99, is one of several points of interest in this section of Condesa. Photography line the gallery’s interior walls, while evocative sculptures dot its lawn, hidden from street view by a ten-foot hedge. Two blocks north of Casa Lamm is Plaza Rio de Janeiro, with its can’t-miss replica of Michelangelo’s David. From the plaza, take 10a Calle de Durango several blocks west and you’ll run into a large glorieta (traffic circle) surrounded by cafes and featuring the impressive Fuente de Cibeles, modeled after a fountain of the same name in Madrid, Spain. You are now in Colonia Roma. No fewer than seven streets branch off of the Fuente de Cibeles roundabout. The widest, Avenida Oaxaca, heads northeast on a diagonal towards Metro Insurgentes, and southwest towards Parque España, at which point the street changes names to Nuevo León. Back at Fuente de Cibeles, the next street over (westward) from Avenida Oaxaca is Calle Medellín, which branches north from the glorieta to Avenida Chapultepec, one of the most vital vehicular arteries in Mexico City. 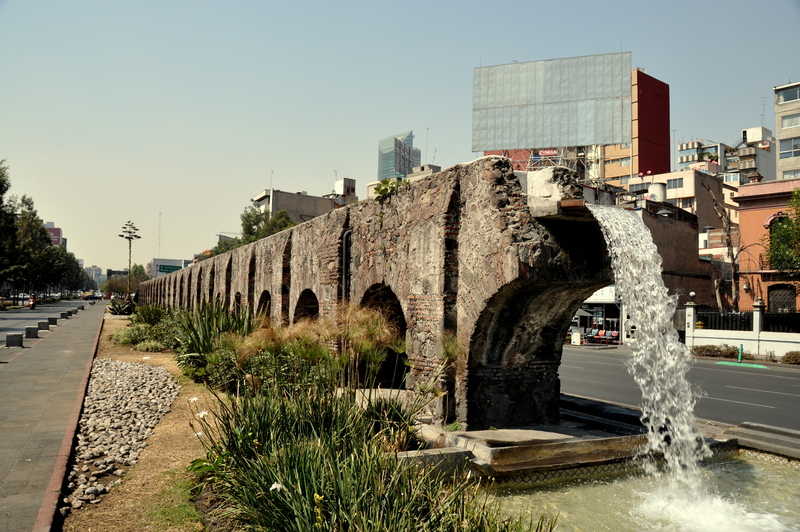 The median of Avenida Chapultepec, at its intersection with Medellín, features the biggest surviving section of the original Chapultepec Aqueduct, which once carried water from Chapultepec Lake to the city center. Condesa and Roma are both known for their Bohemian flair, but less known by many is the Jewish ancestry that comprised these neighborhoods a century ago. I have read that most Mexico City Jews have since fled Condesa and Roma in favor of younger neighborhoods such as Interlomas, but Condesa in the 1920s and 30s was as Jewish then as Warsaw and Krakow, Poland, were at that time. Today, most Condesa-area synagogues are hidden in plain sight inside high-walled residences, but the Jewish Museum, located at Acapulco #70, provides a sobering look at WWII Holocaust atrocities, and about the lives and customs of Jews in Mexico today. The nightlife in Condesa is like nothing you’ve ever seen anywhere else in the world. I was invited for a night on the town by one of my Chilango friends, Andrés, towards the end of my too-brief residence in DF. We met at Rec Karaoke Bar in Condesa (Nuevo León #73), and although I was wearing my newest blue jeans, black shoes and socks, and a yellow sweater that frequently earned me compliments whenever I wore it, I had no idea what I was in for. I was the most sloppily-dressed person there. My date for the evening was a six-foot-tall goddess who was either born rich or earned five times my income. I was wayyyy out of my league…but amiable host Andrés kept the whiskey flowing (no one drinks beer at places like Rec, I learned later) while the deejay kept the karaoke records spinning. Neighborhoods like Coyoacán and San Ángel, the first places profiled in this series, wear their hearts on their sleeves. That is to say that as nice as they are, their charm is out in plain sight. Condesa is different. Blink and you may miss some of its more delightful surprises. Can you find the American Legion Hall, improbably located in Condesa? The life-sized Bumblebee, of “Transformers” fame? Have you ever noticed the dragon light fixtures, adorning the entrances of otherwise unassuming private residences? 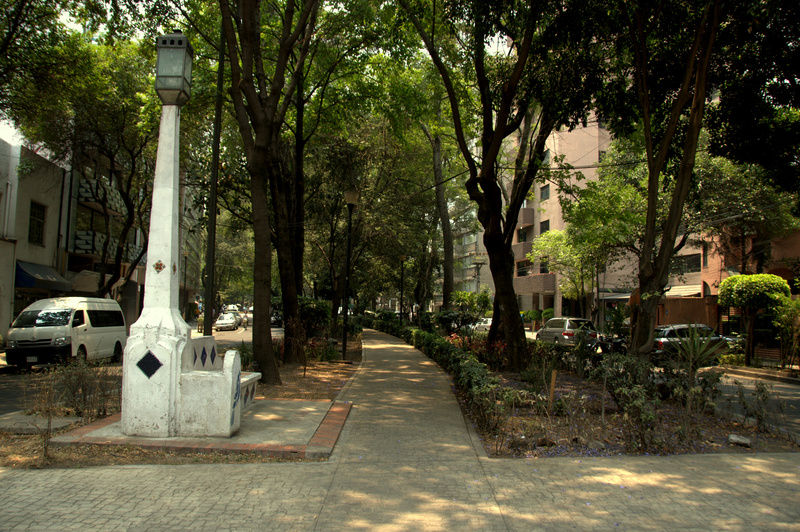 Have your strolls through Condesa ever taken you past Plaza Popocatepétl, a Moorish fountain in the middle of a random intersection? Random discoveries such as these – things you never expect to find when you set out upon your pedestrian journey – are all the more likely to elicit a smile. ¡Vámonos! I really enjoy these “neighborhood portraits” 🙂 You teach me about my hometown. Thanks, Mani! Hopefully I can make a trip down to DF myself this fall and reacquaint myself with all that the city has to offer. I enjoyed reading your post, since Condesa is my home away from home. For several years I have been renting an apartment on Avenida Amsterdam when I travel to Mexico City. 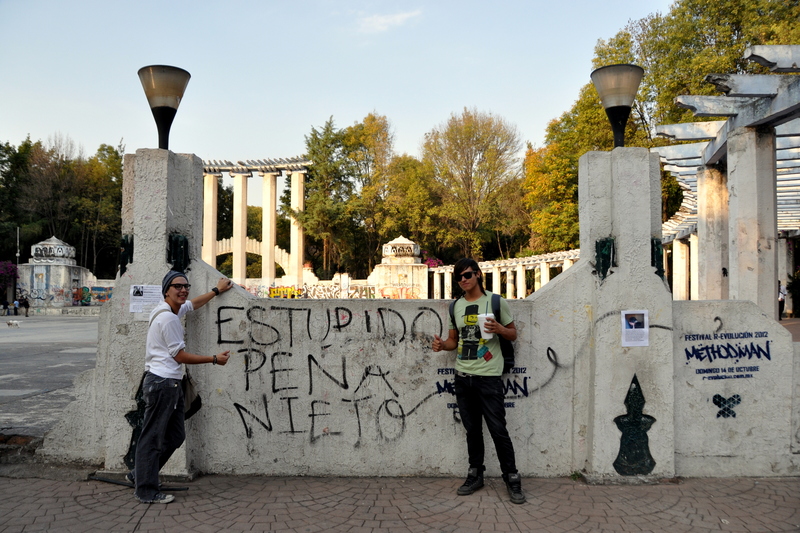 (I am just a stone’s throw from Plaza Popocatépetl.) It is such a delightful neighborhood. By the way, did you know that Avenidas Amsterdam and México are concentric ovals because at one time there was a race track there? Those two streets follow the general outline of the old track. 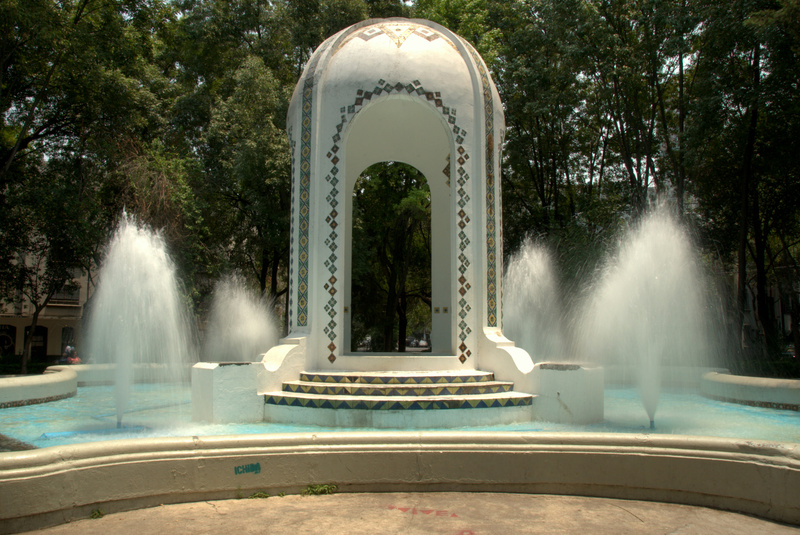 The renovation of Parque México is complete, and, even after a couple trips, the Foro Lindbergh remains free of graffiti. Another bit of trivia… Foro Lindbergh was named after the American aviator Charles Lindbergh, who was a big international hero in that era. He made a good-will flight to Mexico, and, while there, had a romance and eventually married the daughter of the U.S. ambassador to Mexico. Thanks for sharing that interesting trivia – most of which I wasn’t aware of. I am happy to learn that the renovations are complete.